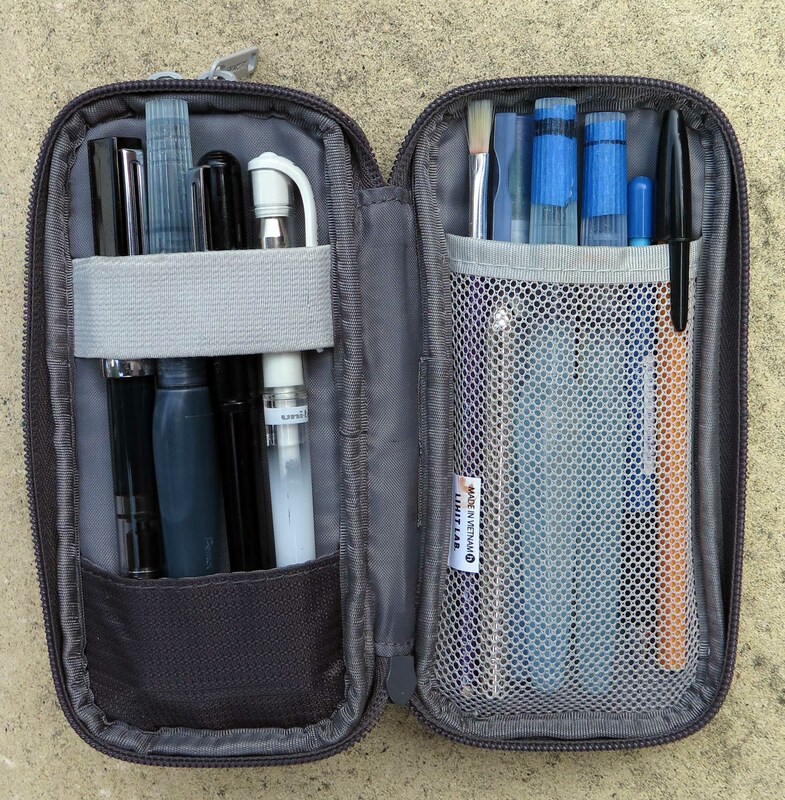 I’ve made some recent changes to my sketch kit and bought a new pen case – “Lihit Lab smart fit small double pen case” that holds all my sketch gear (except the little water bottle) in one compact unit…. 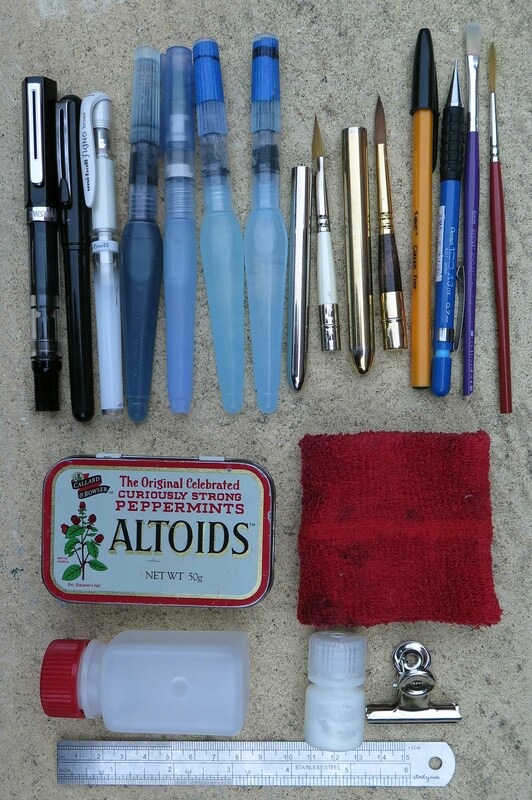 It has 2 sections, one opens like a book with pockets and elastic to hold all my pens and brushes, the other side is a half zip pocket where I store my Altoids paint box and other bits and bobs…..The above pictures are a little misleading, the as the pen is resting on the floor it looks much smaller than the case….actual size see below with pen stored inside…. 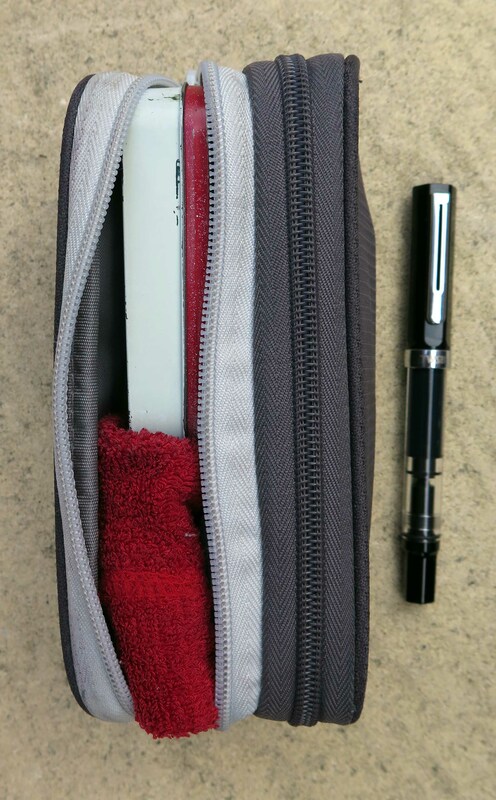 TWSBI Eco fountain pen with Extra Fine nib; Pentel pocket brush pen (cartridge refilled with DeAtramentis Document Black ink); Uniball gel pen with White pigment ink; Pentel broad waterbrush filled with tap water plus a few drops of Lamy black ink (makes a convenient grey ink wash); Zig BrushH20 “broad”waterbrush (this is actually a flat brush); Pentel round waterbrushes sizes fine and broad; Travel brushes (separated in the photo) – 6mm (1/4”) dagger brush synthetic hairs (no name on brush, bought from Malcolm Carver website) and Escoda Number 8 Sable brush; Bic Classic fine ball point; Pentel 0.7mm mechanical pencil with 2B leads; Cheap 6mm flat brush (for gouache); cheap synthetic rigger brush. 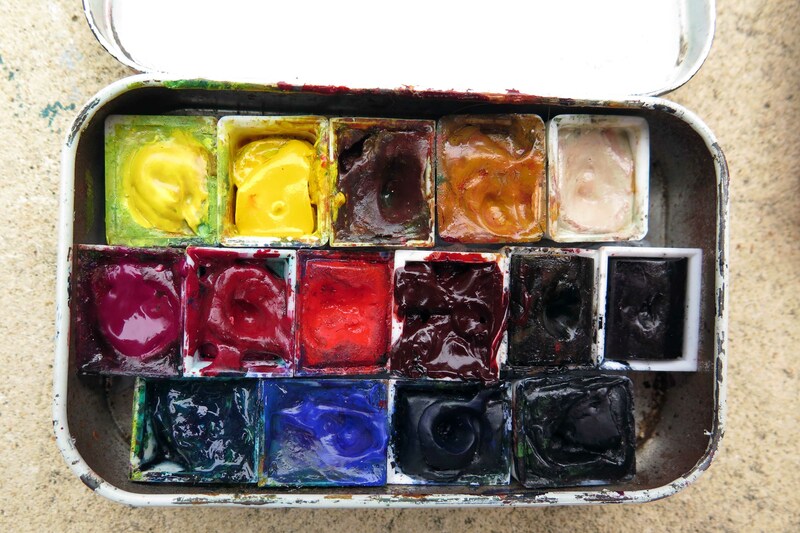 I have to say that 95% of my watercolour sketching is done with waterbrushes….even though I have great “proper” watercolour brushes I still love the convenience of waterbrushes. They do take some getting used to ….hold them lightly and gently – don’t squeeze the barrel unless you want water. It is possible (though a little tricky – needs practice) to get dry brush effects…. thoroughly wipe off excess water from the bristles and paint holding your paper and brush vertical (with the bristles pointing skyward) it feels a little strange – but gravity can’t pull the water down down out of the barrel! 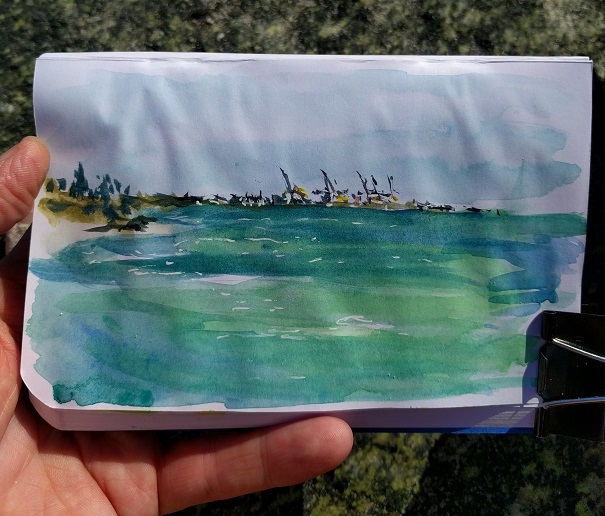 Very quick sketch (no ink – only watercolour) this arvo sitting on the rocks of Cottesloe groyne, looking North (with my back to a cold Southerly wind) a good swell rolling in. A few surfers about in the choppy sea. 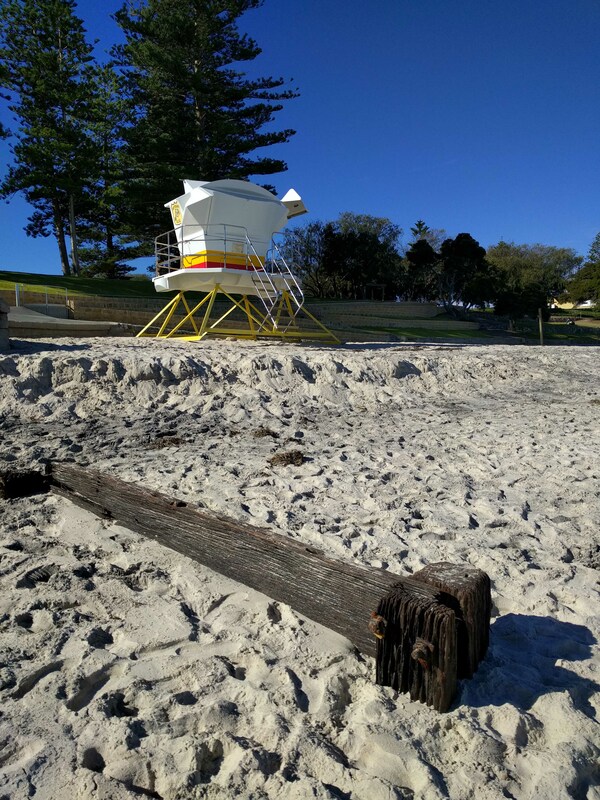 Cottesloe Beach – the old timber jetty appears ? Autumn tides have shifted the sand around the local beaches exposing limestone reefs and ripping up old seaweed in great heaps on the beach. 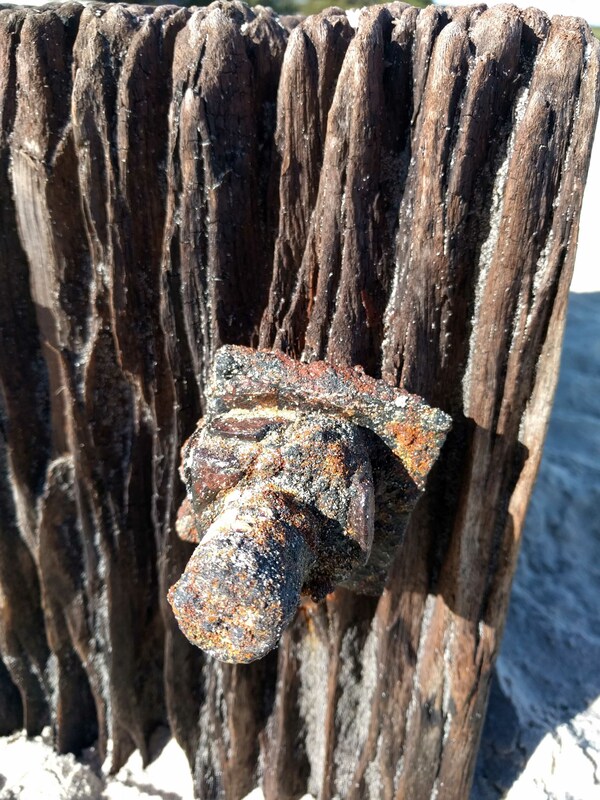 But today I saw something that I’ve never spotted before….old wooden post and rail with large iron bolts sticking out of the sand just in front of the Indiana Tea House on Cottesloe beach. 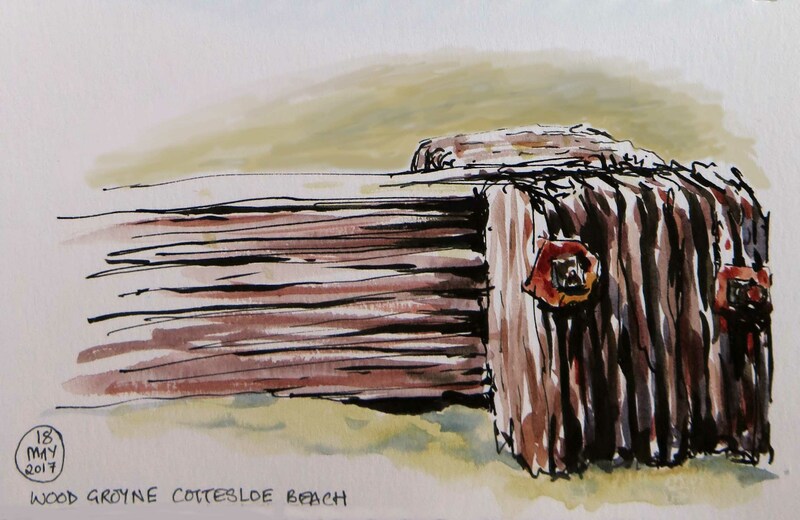 It seems this wood could be part of the original Cottesloe Jetty built in 1906 to make it easier for fishos to get out past the reef and allow people to “promenade” as was the thing to do in those days. 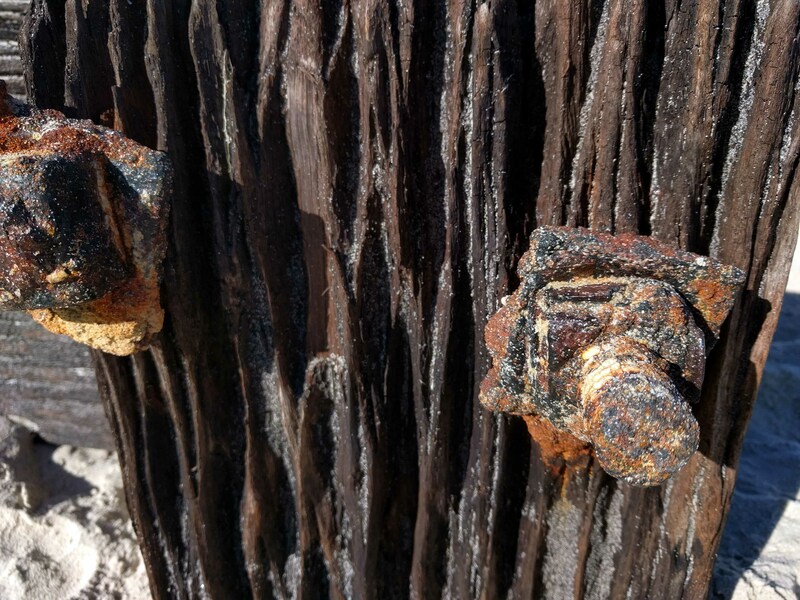 Unfortunately it was fairly short lived as the pylons were damaged by boring mollusc and later winter storms. The jetty was eventually condemned and blown up in 1952 with gelignite. Finally a quick scribble with pen and coloured pencils, looking North…. Cycled around the old Sunset Hospital site on the foreshore at Dalkeith this morning, it’s just been opened to the public having been closed and fenced off for over 20 years. Built in 1904 as the “Claremont Old Men’s Home” it was renamed as “Sunset Hospital” in 1941 when it became a hospital for returned servicemen and later a public hospital for men and women. Most of the 13 buildings are still fenced…. off presumably awaiting renovation. There are new BBQ facilities, children’s adventure playground and good seating underneath massive Moreton Bay Fig trees which overlook the Swan river. Current renovations have been financed by selling off part of the land to the Sultan of Johor, the long term plan is to preserve the heritage listed buildings for future arts, culture and community use. 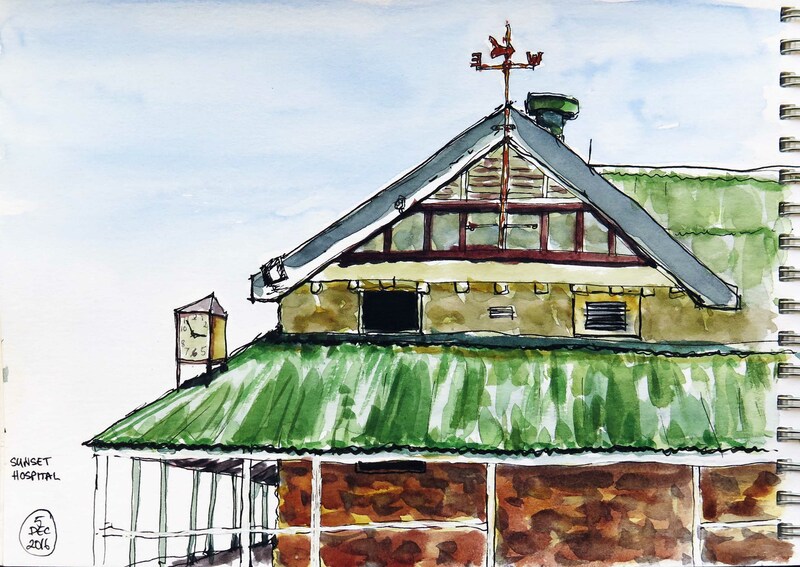 Finally….. a quick sketch of the Perth skyline from Matilda Bay Tearooms (which have also been renovated). 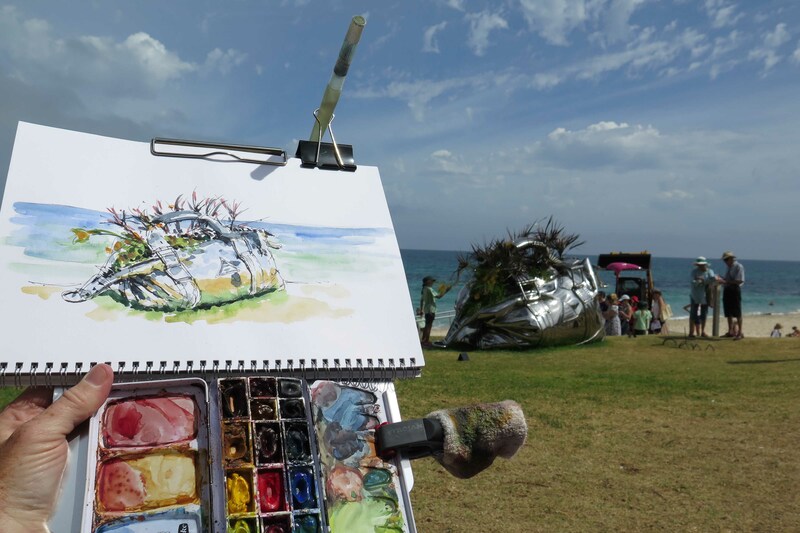 Sculptures by the Sea at Cottesloe beach yesterday. 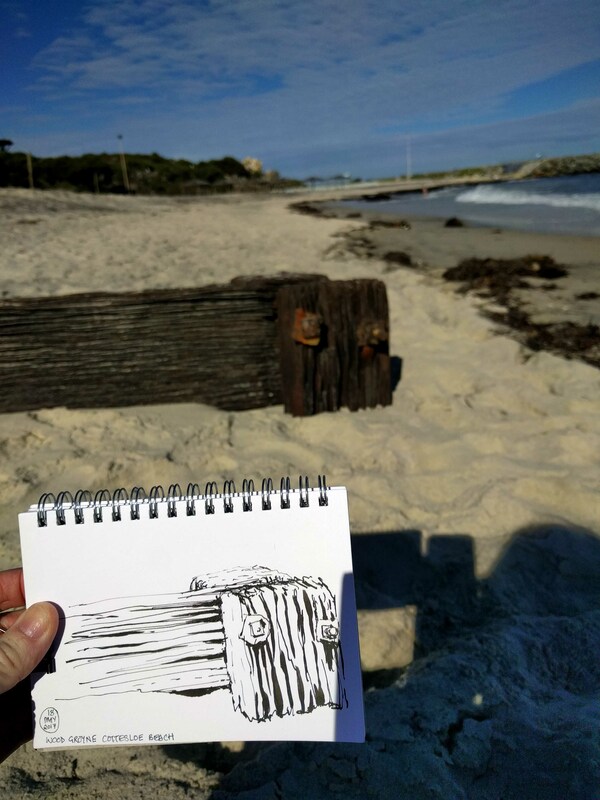 An unusually humid and steamy day in Perth but great to go and check out this years sculptures on iconic Cottesloe Beach (one of the best beaches in the world)…it’s been a while since I’ve been out sketching. There was the usual eclectic mix of weird, funny and beautiful creations from around the world. 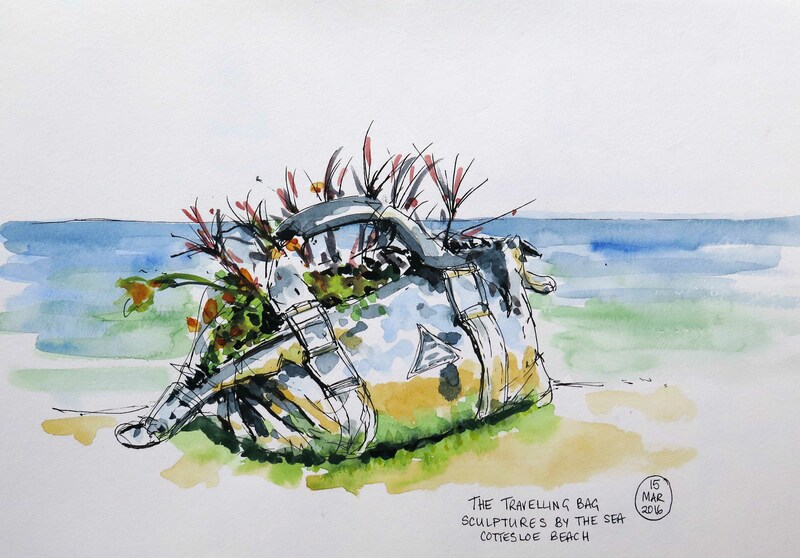 Couldn’t sketch them all in a morning so together with sketching friend Aggie we found a sheltered spot next to a wall out the the full sun to settle down and scribble. This piece is titled “Travelling Bag” by Yumin Jing of China and is a lovely recreation of a handbag made entirely out of steel with rare plants growing inside, the reflections off its polished surface are amazing (and hard to paint!). Fun to watch all the people and overhear their comments (especially the school kids and their teachers). 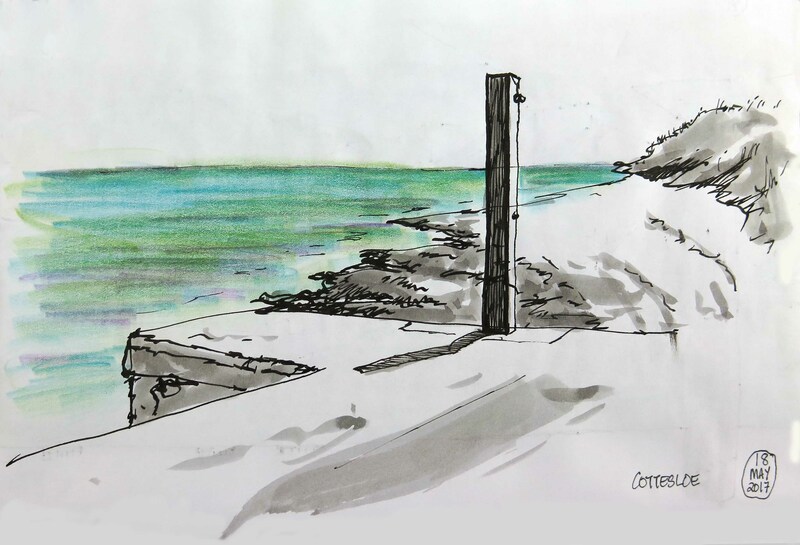 This other sketch below is just quick gestural scribbles of people wandering around looking and relaxing on the beach. 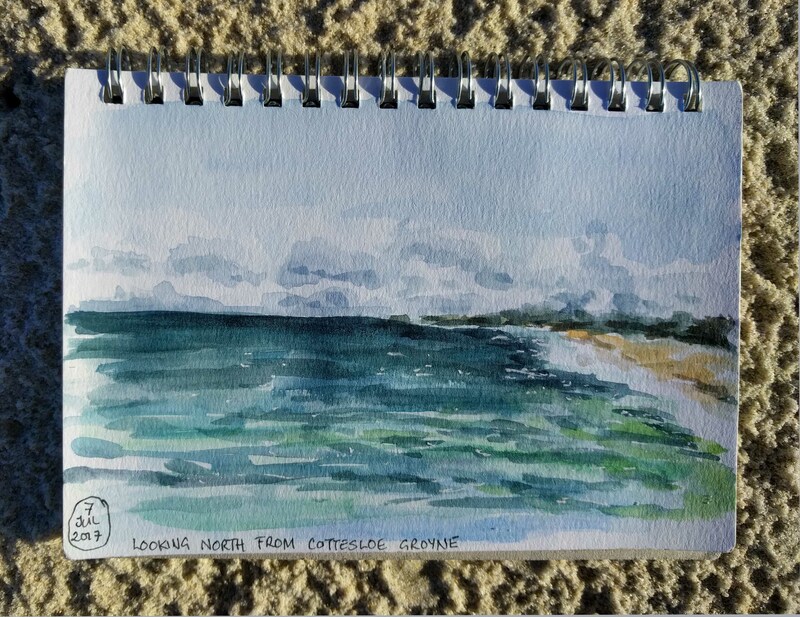 Finally after all the sketching I had a quick swim in the Indian Ocean to cool off….a perfect morning! 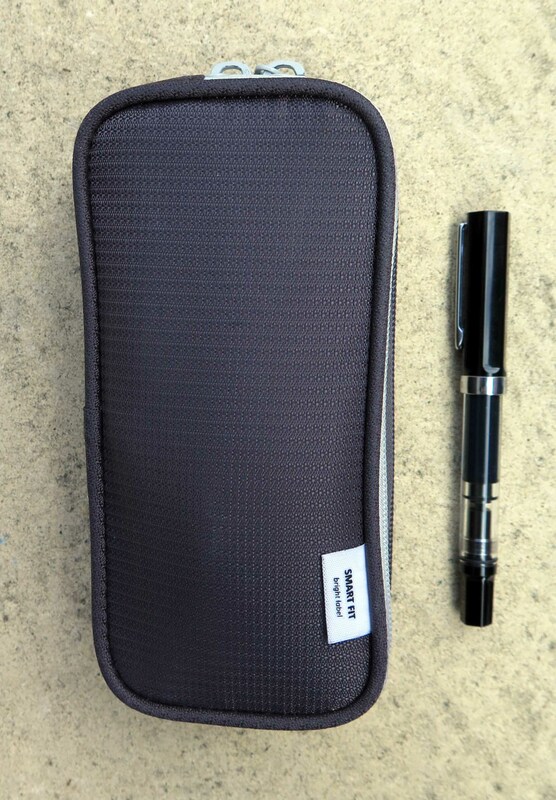 Pilot Parallel pen 1.5mm with DeAtramentis Document Ink black, various watercolours, Pentel waterbrush, Holcroft sketch and draw A4 diary 225gsm. 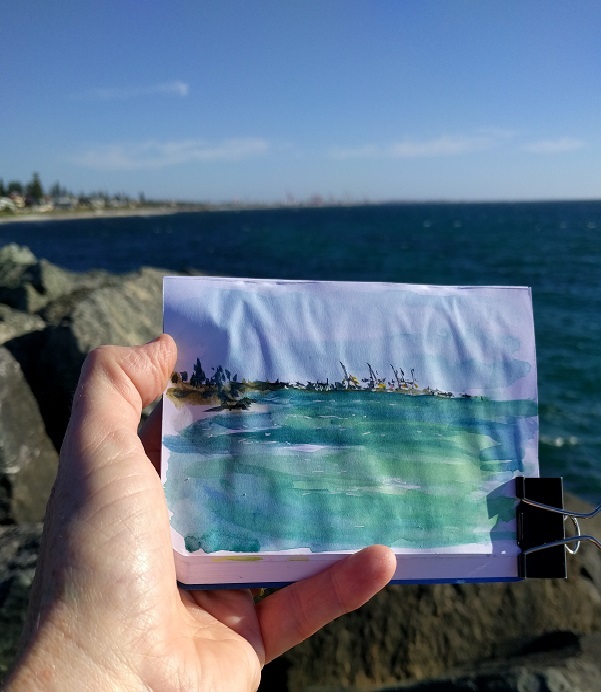 Gorgeous winters day down at Neil McDougall park in Como with the Perth Plein Air Painters, blue sky and warm in the sunshine. This park has lots of grassed areas, bbq, toilets playground and lovely trees around a small lake. At one side a small community garden has been created by locals on the site of an old dairy farm (until 1946). Seedlings and plants in raised beds are nurtured by local families, sponsored by local businesses and managed by a dedicated committee of local people, it is available to everyone to grow. 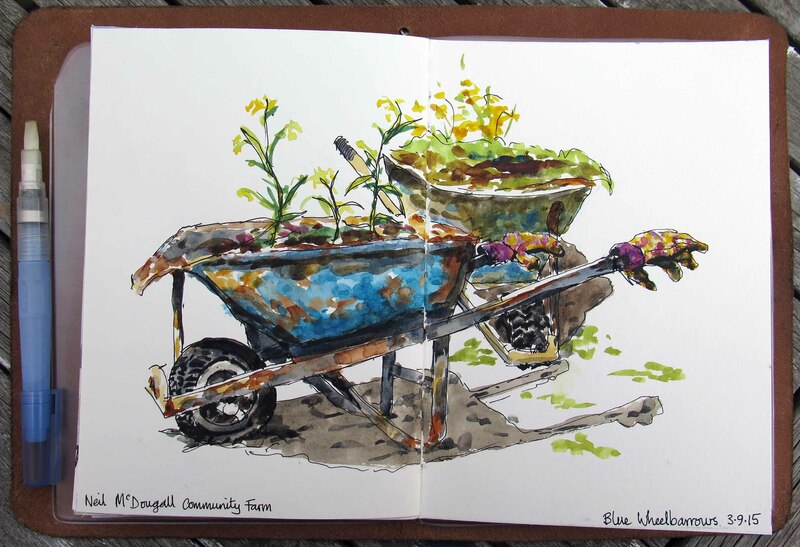 These rusting cerulean blue wheelbarrows are parked in the middle of the raised beds with plants growing inside (tomatoes I recognised), a pair of floral gardening gloves were waiting on the handles of the nearest barrow. I used a new waterbrush for much of this painting, a Kuretake Zig “broad” brush which is actually more like a flat brush….very useful for large sweeping areas. 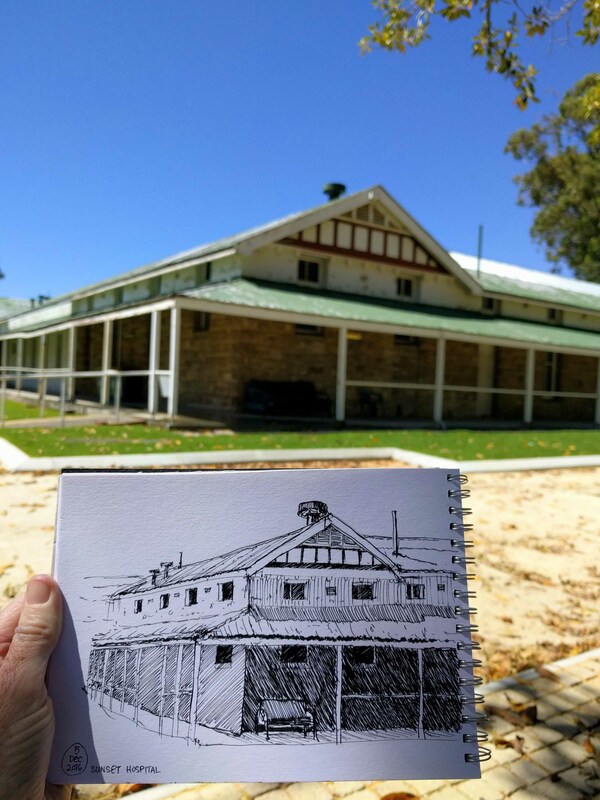 Next door to the veggie garden is Hazel McDougall House, a bungalow built in the 1930’s and restored in 1979…it’s the HQ of South Perth Society of Art and Craft. Homemade diary of Westart heavy weight cartridge paper (225gsm), pencil layout (erased), Lamy Safari EF nib with De Atramentis Archive ink black, various watercolours with Pentel waterbrush broad and fine, Zig Kuretake waterbrush broad (flat), White gouache.